Pouty lips? Nah! It was an accident. My upper lip got swollen. Thanks to the ant (or ants) that was on the star bread that I'm munching. I didn't noticed that there's an ant. 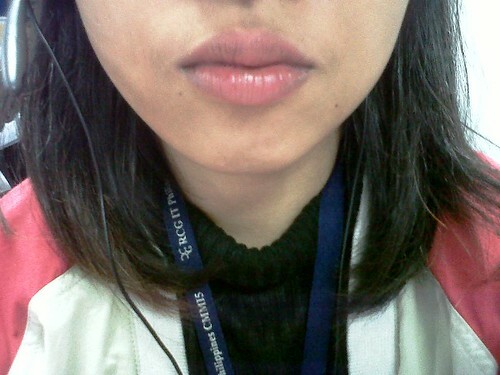 After finishing up the star bread, my lip got itchy and then in a matter of minutes I have this swollen lip. It lasted for 3 hours and after that it's back to normal. My crazy idea, if you want to have pouty lips like Angelina Jolie you know now the best and cheapest way to achieve it... Lol. 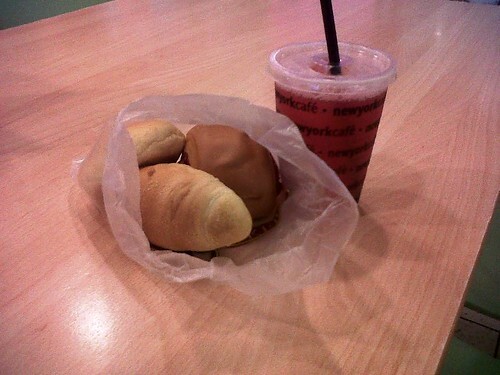 This was my breakfast last January 26th. I was with my two colleagues and we decided to grab a bite before going home. I was hungry from all the work that I done on that day. It was a hectic and stressful day and it will not be the first time. On our region we have tons of reks! That reminds me that I need to work double time today and tomorrow. Otherwise, we will be in big trouble. So cheers to breakfast with friends! That's one of the ways that will keep you sane from a toxic work. And if you're wondering if I'm on a diet. Yes is the answer. I'm cutting down my rice intake though I know that eating lots of bread is equivalent to 1-2 cups of rice. 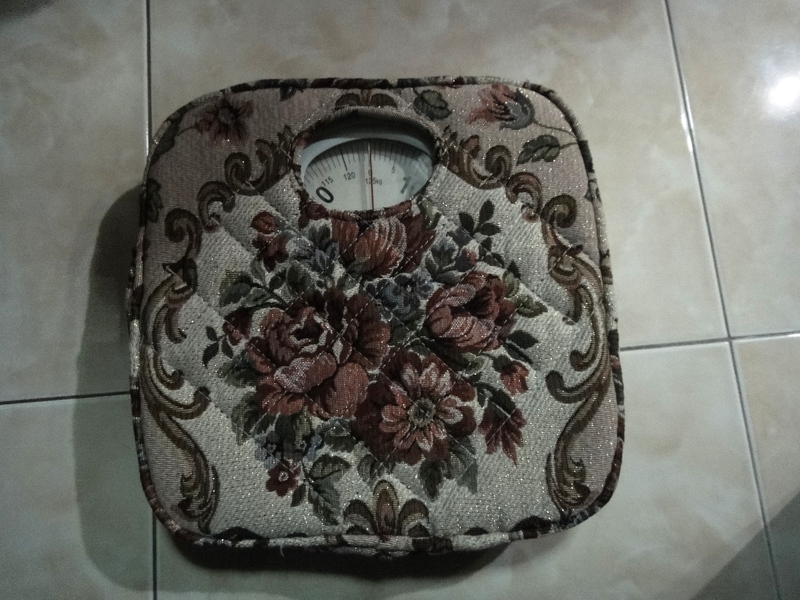 Apart from my so-called diet, I'm trying my very best to exercise at least 3x a week. I hope I can keep this up for this whole year. 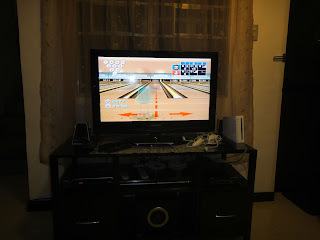 Sorry if the picture is blurry since I used my BB 8520 to take this photo. 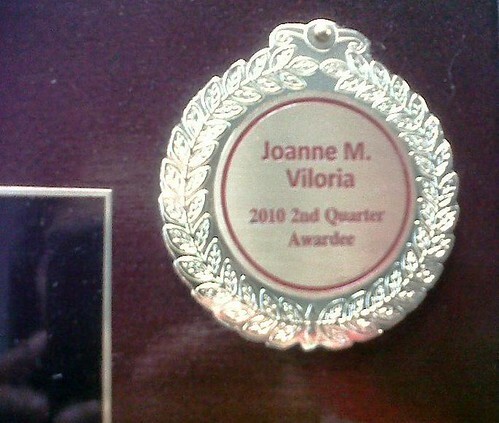 This was the award that I received last June 2010. The Recruiter of the Quarter Award is given to a recruiter with the most number of hires and the most higher profit margin. I had the most number of hires for the 2nd Quarter thus I got this. I was mighty proud! I was still in probationary period so I felt good of myself. Apart from this "medal" and recognition, there is a cash prize which I will not disclose. Now that I'm free for the time being, I'm going to maximize it so I can lessen the tasks that I need to accomplish. Sigh! This is the BIG difference when you're working at a normal schedule versus the night shift. This is the truck that regularly collects our garbage every Monday and Thursday. Obviously I can't think of anything interesting to aim my BB camera so I ended up with this photo. 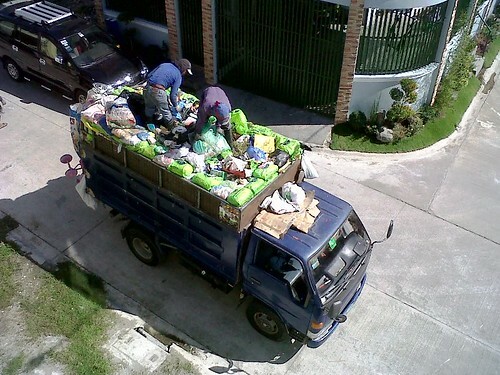 In fairness to them they make it a point to organize and pile up the garbage bags at the back of the truck. I'm proud we have these people to help us with our trash. Five stars for all of you mga Kuyas! I so like this picture of us! 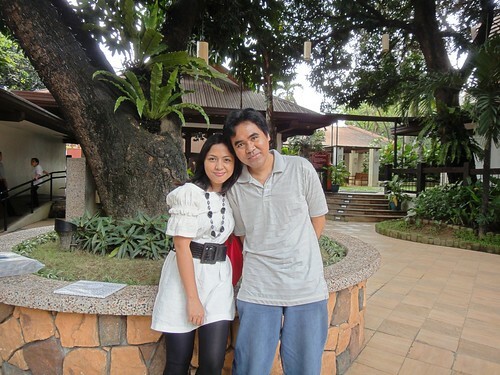 It was taken last Sunday where we attended Paul Vincent's baptism in Mt. Carmel Church. Reception is in Max's Restaurant in Tomas Morato. Thanks to Brian for making me one of the 'ninangs' of his unico hijo.Welcome to the Christian World Vincent! The new theme that I installed in my BB. It's an animated scene of a storm where the clouds are moving and the lightning keeps on flashing. It was rated high in the BB Apps World and I know the reason why. It's kinda cool and it's not the usual boring themes. I bet that I will be using this theme for a long time. 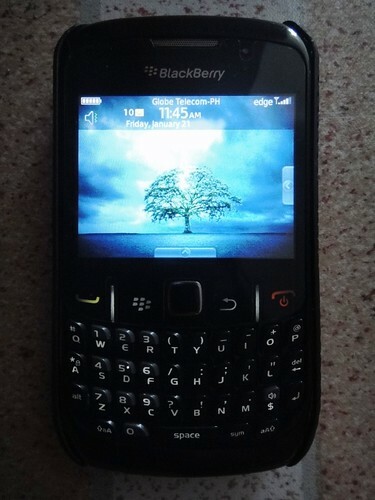 I even made a joke to my officemate and told him that I have a BB "Storm" (literally speaking). Lol. Technology can make things impossible, possible. 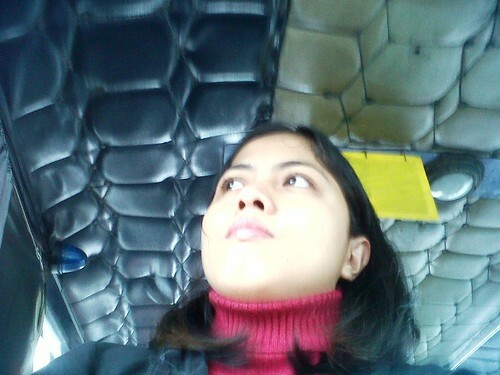 I took a picture of myself while inside a jeepney. This is my route every weekdays whenever I will be going home from work. Sometimes due to the tiredness and sleepiness, I ended up taking a nap inside the jeep. I know it's reckless and a stupid thong to do that but I can't help it. At present, CJ (the one in the picture with me) is already in Dallas. This was taken in our office pantry as we gave her a surprise lunch treat. She will be working in our company's Dallas office and most likely she will be back in December. It's the first time that our company send a recruiter in the US to replace the American recruiters so imagine how important this is for her and for our team. We got to prove ourselves and show to the management that we are as good as the recruiters in the US. I was excited to see the deal in Deal Grocer for a 3D and 2N stay in Bellaroca which is good for 4 people. 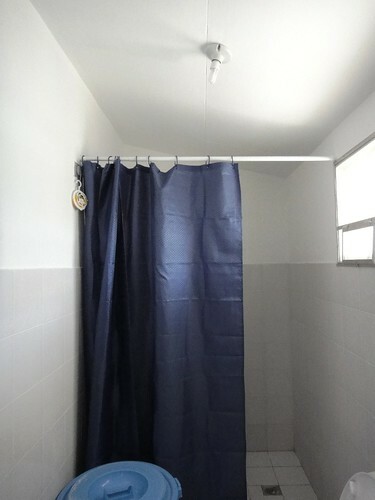 You only have to pay for Php 25,000! 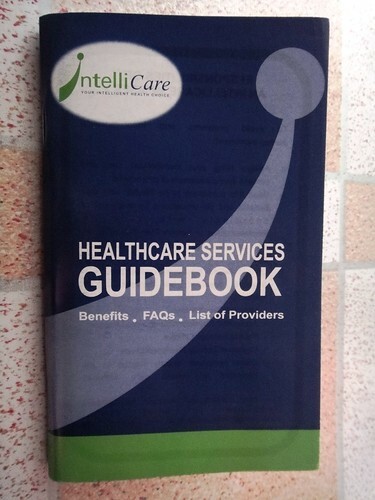 It was a good buy considering that the published rates in their website is way over our budget. I was even planning ahead like checking the dates and the flights available only to be disappointed. My sister and her bf decided not to push through with my idea of going there since they pointed out that the food is expensive. Unfortunately the deal that they are offering does not include meals. I am disheartened by this news. 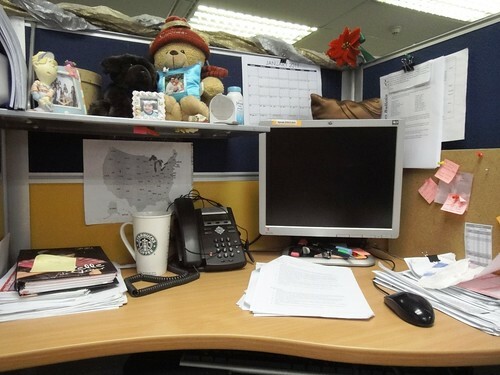 This is what the "cubicle" looks like in Shui Spa. 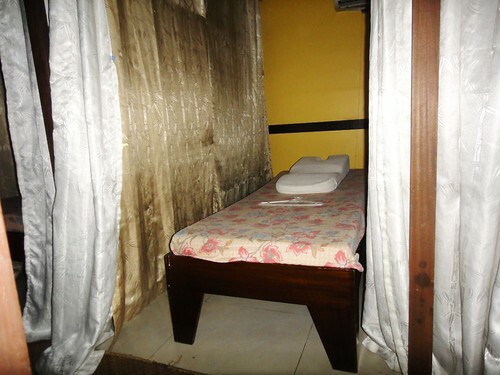 My sister and I went there to avail of the 90 minute body and foot massage that I bought in CashCashPinoy since the validity of the coupons is up to January 31st. This massage treat serves as my Christmas gift to my sister. I'm also giving 2 coupons to my aunt and her husband so they can enjoy the massage just like we did. I'm looking forward to have another massage. I was thinking of making it a habit to have a massage at least once a month to de-stress. It was an effort on my part and hubby to brave the rain and the traffic from Cavite going to Pasig just to be a part of this "get-together". All of the people on these pictures were my colleagues at the office. 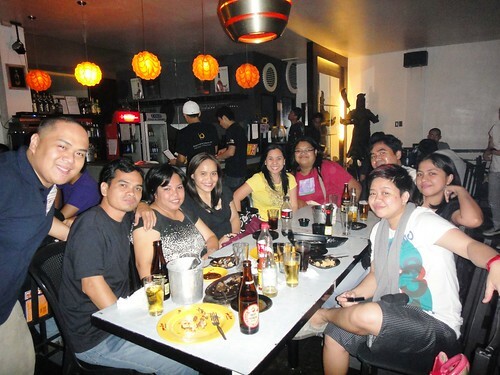 It's a "farewell" bonding in a good way for CJ who will be leaving on 22nd to work in Dallas. She will be the first from our team to have this kind of opportunity but she deserves it anyway. She's hardworking and pushing herself to the limit. I wish I can be like her but my priorities right now is not leaning to career. You want to know? It will be a secret for the time being. Have a safe trip CJ if ever you happen to read this blog of mine....hehehehe. Some of you may have seen this or some may not be familiar with this tag line. 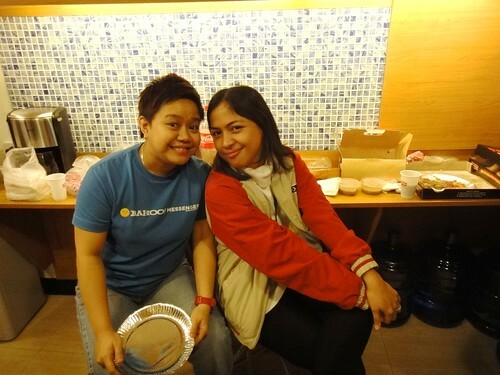 I visited a friend in Ortigas and we looked for a place to have our brunch. We ended up in Yellow Cab since this store is not yet open. 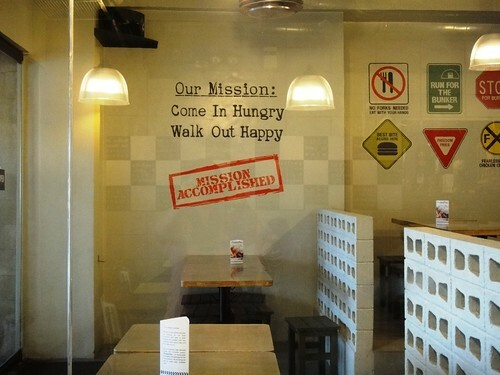 Their mission is very catchy and intriguing, don't you think? I was checking for the accredited doctors and hospitals near our place since I need to look for a dentist, OB and Urologist. 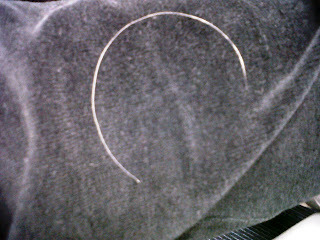 I need a dentist for my tooth that needed to be extracted. An OB to have my reproductive organs check before the plan of having a baby starts. A Urologist for hubby to check if his kidneys are A-OK. We missed having our respective checkups last year so we need to do early this year. I still need to call the secretary of my OB from TMC since I'm asking them to provide me a copy of my laboratory tests like the Pap Smear result. I've done that twice last 2009. I hope to accomplished these before February ends. My schedule is tough to manage since I'm working at night. Anyways, I have never forgotten about this project. It's just that there are some instances that I would like to gather all the pictures and upload them at the same time rather than day by day...hehehe. 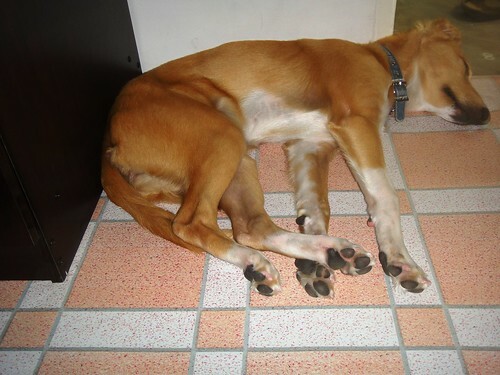 That's our "baby" who always wants to sleep in our room or outside our room. I guess she is used to seeing me and hubby during the day rather than my sister whom she gets to see at night. Look at her! She's all grown up. I'm guessing that she probably weighs 12-15 kilos. She's 5.5 months so in canine years, she's considered a pup. Once she reach 12 months, then she will be an adult. Sniff! I'm going to miss the round puppy that she was when she first came into our home. It's evident in my body and a lot of people noticed it. Now where do I begin in having that body that I once have... For some reason food in my eyes and taste buds are irresistible and it's hard to ignore it. Sigh! I need to discipline myself starting tomorrow. I'm going to eat fruits and oatmeal as a replacement for rice and I'm going to do some exercise at least twice a week. It's time to be healthy again. 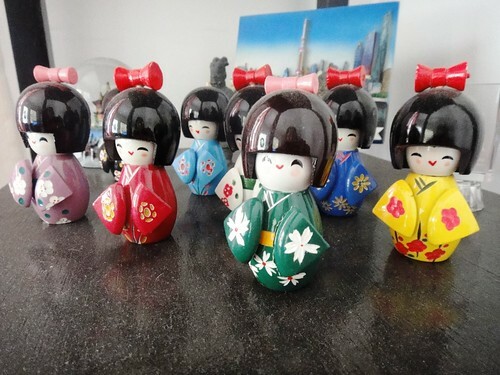 These are the Miniature Japanese Wooden Dolls that my sister bought in Old Street (Shanghai, China). 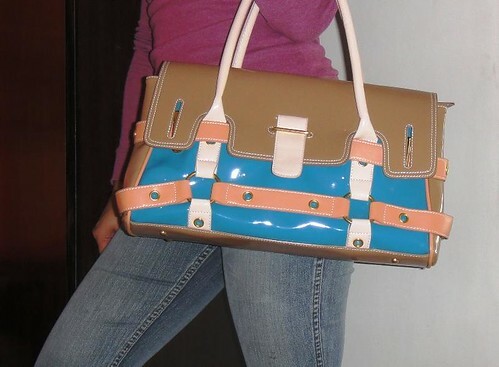 I was with her when she bought this and boy, my sister really knew the craft of haggling unlike me...hahahaha! Looking at them makes me smile and reminisce the days that I went to Shanghai when I visit my sister. I can't believe that it's almost one year. I got a Clinique Happy Heart Set last November from a friend whose been living in the US majority of his life. He is a good friend and I never thought that we could be one since I seldom see him in person and our meeting is not the usual story that you hear. I guess "true friends" knows no distance. I was so happy when I received this gift box in Macy's paper bag. My colleague in the office who was sent off by our company to NJ/NY met my friend and he brought this paper bag at the office. I took a Mefenamic capsule to ease the pain. Hope it will work since I have to get some sleep before work. If only I have nothing important to do at the office today I would've taken a leave and go to the dentist to have this tooth extracted. Or I can do it tomorrow...hmmm...If the pain doesn't stop by later this evening at work, I'm going to the dentist. I have to check the accredited dentists of my HMO. 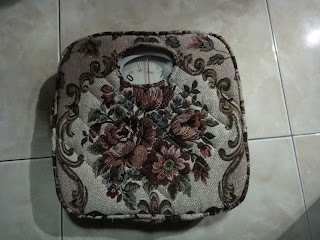 I went last Sunday to visit a friend and when we went to our house I was in awe to see that most of her furniture and fixings have this "uniform" and that includes the mirrors in the bathroom and this weighing scale. She is super OC when it comes to cleanliness and coordination. Sigh! My very own timesheet at my workstation....ahahahaha! 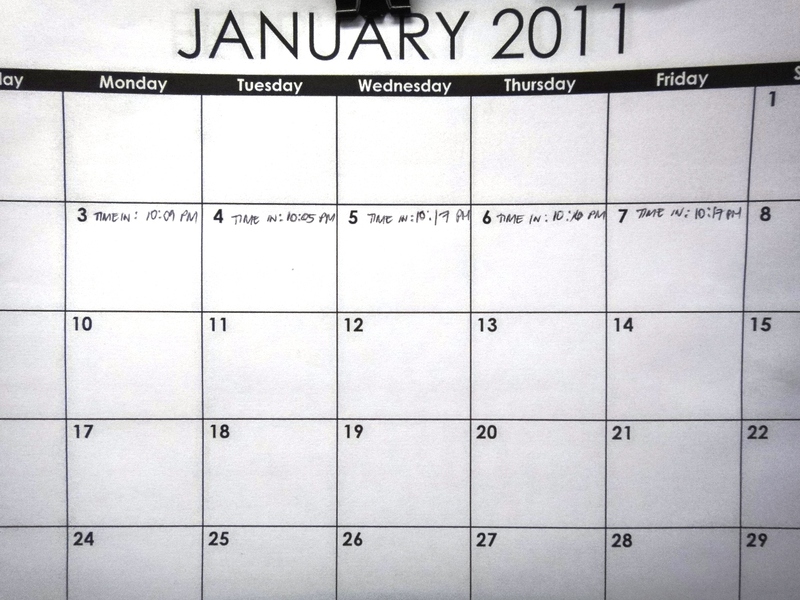 Fors the first week of January, I don't have any lates. Kudos to me! Thank you for no traffics and faster vans. An effective prayer that was shared by one of the members in a yahoogroup where I belong. I always say this prayer last month in hopes of granting our very wish.....true enough, our prayer has been answered! It's either a coincidence or God had made a plan for us to have this very wish granted. I plan to keep this prayer and I even shared it to a couple of friends. God is good indeed! Inside this bag was supposed to be my lunch at work. Chicken pie from Banapple that is so yummy! I ended up bringing it at home since a good friend of mine asked me to have a lunch out with him together with another friend whose visiting us. It was the first time he is going to treat me so I didn't decline. This is a once in lifetime event that I can't pass! Hahahaha. The husband loves the chicken pie and asked me to buy some for him once he starts his training. 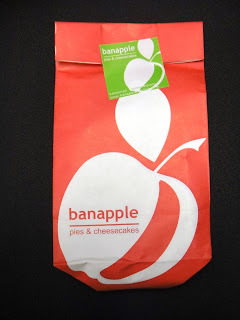 It's affordable too, Php 65 and the pie is huge! 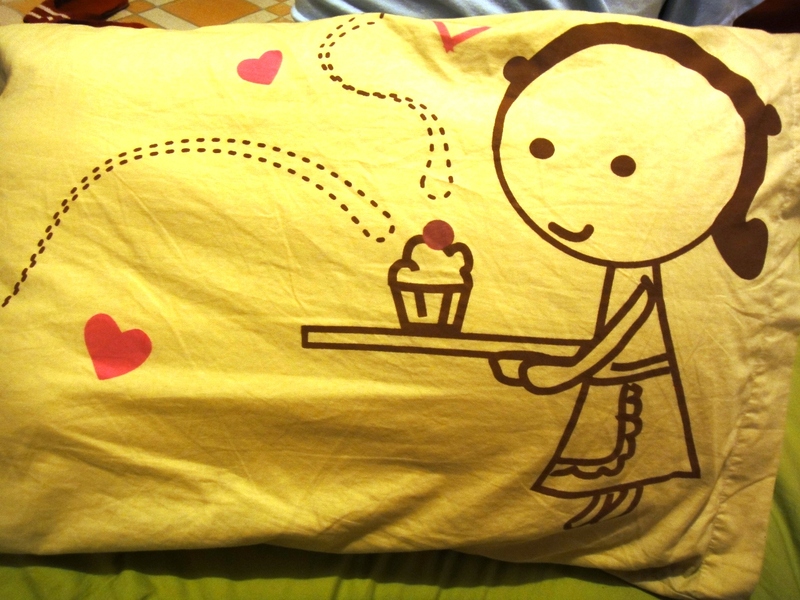 One of the couple's pillowcases that I bought last 2009. I always make it a point to used the pillowcases depending on the color of our bedsheet and curtains at our room. Hehehehe.This is my favorite among the three pairs. This is the view from our 3rd floor living room area. When I took this picture yesterday, the wind is blowing through my hair. No need for us to use an AC unit. 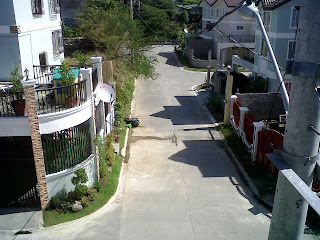 It was a quite and peaceful afternoon that makes me want to extend my leave.....hahahaha! There's no better way to start this project rather than the first day of January. 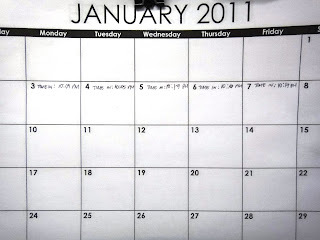 I decided to join the bandwagon in order to remember each days of my life for 2011. 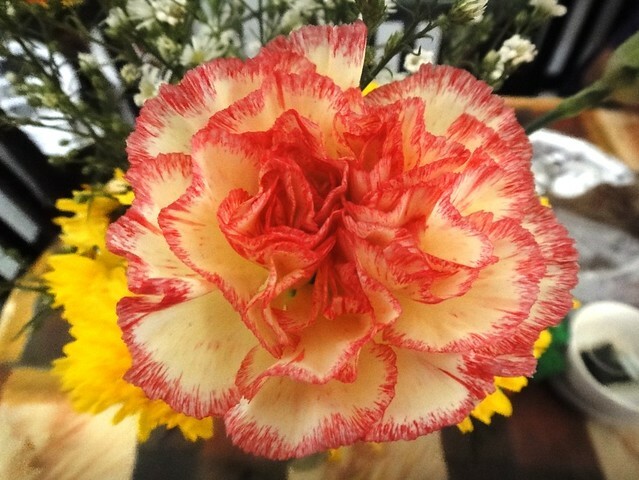 It's one of the flowers in a vase on top of our dining table. I took a picture of it since the colors are lovely and come January it is in full bloom. Reminds me to start the year right by being optimistic and enthusiast of the coming days ahead. 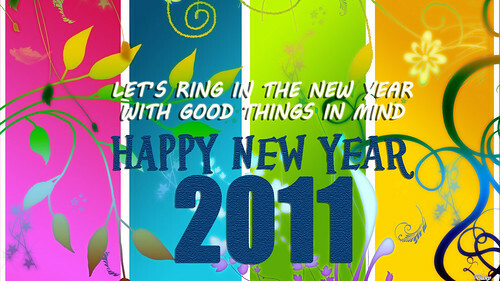 Cheers to a positive and fruitful New Year to all of us!